Been doing more work on Visu Player with my free time, even though its been very limited these past few weeks, and will pretty much not exist this entire week, due to an upcoming showcase, and some other personal projects, organizing my team, and its just a bit hectic right now... But eh, progress! So, the team is back at development again, and the new content is looking and sounding nice! - expect more updates within the next month for Fantasy Fighters and Anti AIr Strike. As a side note, me and a friend (Christine Harte) have been working on a mobile game thatll soon be released for Android and Web platforms. Stay tuned for updates on that! 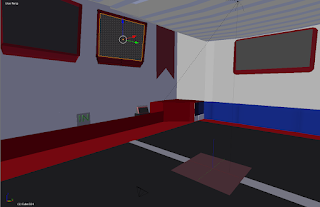 Been working on some ideas - a simple gym room for a simple-ish dodgeball-like game, and some advanced AI coding techniques while working with the team slowly, but progressively on the completion of Fantasy Fighters and Anti AIr Strike, estimated to be complete by January -- work never stops! Recently iv gotten a new job and been working hard on some projects and also new ideas and concepts, and in a few months, once me and my team have these projects complete, ill be doing a re-design of the site, just to give it a different look, and mostly display the Games tab a whole lot better, and make it easier for myself to upload games and make them free to download. I might also be adding a Web element feature so you can play or try out some of the games that support it, right from the website before downloading it! - And Blueprints will soon also include many more ideas and polls/surveys to get your opinions and feedback on interesting topics, that could potentially span more ideas, games, and useful apps! Found a new FTP to upload my games and apps to, so no more broken link issues. More games on the way, and more games in the works! You may have noticed trying to click on some of the Download buttons on the Games section, will not work, im working on fixing that, by using a 3rd party storage instead of FTP load, so as soon as I can get that going, ill make some updates about it. Note, that because it will be through a different storage method, you may get warnings about downloading a file from this source as being "untrusted", and thats because its a free service. Aside from that, you should be able to download games off the site as you could normally before, with that possible warning prompt that Windows and your browser does. DTD (Dibbie The Developer): Projects Coming Soon Preview! Its here! The new stuff im working on, the last project is a community-design project, meaning once I get a few bugs worked out, it'll be a long term project designed with the players help, if they so choose, or sit back and watch as it evolves and develops. If you like it, then it may just become an actual game. Its designed to be a FPS.